Beginning Thursday September 3 at 10am Preschool Story Hour returns for children age 5 and under. Each week will feature old and new stories, along with simple songs and crafts. This is a gentle introduction to the library for the very young. 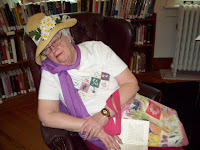 In May we presented Murder in the Library, an interactive mystery play! The cast included library staff, board trustees, a lively audience, and even the Mayor of Paxton. Murder and mayhem reigned and our star was declared "Deader Than a Doornail!" 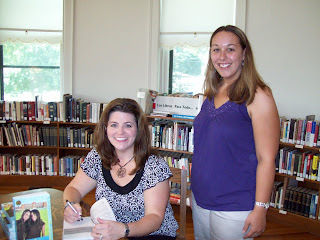 Local author, Nicole O'Dell (left) visited with library clerk, Katie Greenlee, on Saturday. Nicole's new books for preteen girls, Truth or Dare and All That Glitters are part of her Scenarios for Girls series. 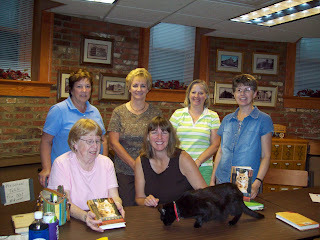 The Pageturners Book Club and Melvin librarian, Jacqueline Allen, visited the Paxton Carnegie Library on Monday for a discussion of the book Dewey: The Small-Town Library Cat Who Touched the World by Iowa Librarian Vicki Myron. 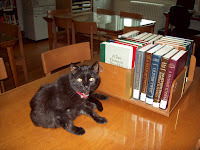 Max joined the group to share his thoughts on life as a library cat.